Hurricanes, as we've seen, can wreak serious havoc when they strike populated areas. We've never had control over them before, but one researcher thinks they could be broken up with F-4 fighter jets. 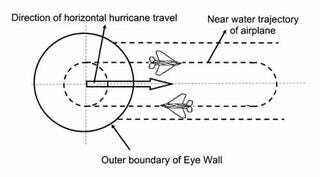 In theory, sending in a pair of the jets to do loops around the eye of the hurricane while it's still out over the ocean, creating sonic booms, would break it up before it hits the shore. Jet fighters flying at supersonic speeds along special trajectories with a hurricane/typhoon at various altitudes would create supersonic booms. In one such embodiment, the trajectories for the supersonic booms of the present invention are counter to the rotational component of the hurricane and/or typhoon being targeted. As such, supersonic booms can be tailored and/or designed to partially and/or fully -negate the basic rotational contribution in a hurricane by slowing down a hurricane's/typhoon's rotation. Additionally, when supersonic booms propagate downward to the surface of the ocean they also destabilize a hurricane's/typhoon's structure by increasing the pressure in the central part of a hurricane's/typhoon's eye.